A master of Law from the National Law School of India University, Bangalore, Bibhu Prasad Tripathy, Managing Partner of Lex Publicio, has splendid contributions to his profession. He practices in constitutional forums of justice such as the High Court of Orissa, High Court of Delhi, and the Supreme Court of India. 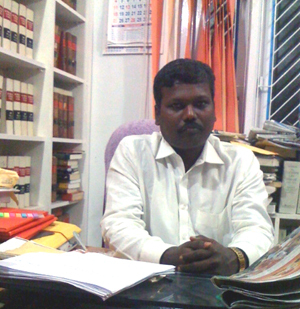 He also practices in the National Green Tribunal, and National Consumer Forum. Amidst engagements in such great ramparts of justice, he also creates time sometimes to assist the justice delivery system in solving intricacies of law. His argument in matter of a Bail Application in the Court of the District and Sessions Judge, Cuttack fits perfectly into this page. The Samaja, a powerful newspaper of Orissa, allegedly occupied by Servants of the People Society through fraudulent means, has become a battleground for rival fractions and the fraction that has captured the office of the Samaja is misusing its media power to browbeat the rivals through gained over police black sheep. Thus a life member of SoPS Sri Brajaraj Das @ Brajabhai and the President of the newspaper’s employees association Sri Devi Prasanna Nayak were booked by the police on cooked up charges leveled through a FIR which eventually landed the court as a G.R.Case. Bails denied in the primary Court, Das and Nayak had to prefer an application for bail in the District Court through Advocate Bibhu Prasad Tripathy. It was shocking to see that the media house Samaja was trying to browbeat the Court by engaging a top criminal lawyer to oppose the bail application, when the Court was only to be addressed by the public prosecutor on behalf of the State. Tripathy vehemently objected to that. He argued that the private counsel for the informant has no right of audience in the Court hearing the bail application. The Court agreed. We post here his argument in public interest. That the sought questions for consideration during the time of hearing of the bail application of the accused persons was whether the informant private counsel has an independent right of audience or in other wards whether a third party/informant can present oral argument against the petition for bail filed by the accused persons? (1) The Public Prosecutor or Assistant Public Prosecutor in charge of a case may appear and plead without any written authority before any Court in which that case is under inquiry, trial or appeal. (2) If in any such case, any private person instructs a pleader to prosecute any person in any Court, the Public Prosecutor or Assistant Public Prosecutor in charge of the case shall conduct the prosecution, and the pleader so instructed shall act therein under the directions of the Public Prosecutor or Assistant Public Prosecutor, and may, with the permission of the Court, submit written arguments after the evidence is closed in the case. That, a Three Judges Bench of the Hon’ble Supreme Court in Shivkumar Vs Hukum Chand & Another (1999 (7) SCC 467) has categorically stated that from the scheme of the Code the legislative intention is manifestly clear that prosecution in a sessions court cannot be conducted by anyone other than the Public Prosecutor. The legislature reminds the State that the policy must strictly conform to fairness in the trial of an accused in a sessions court. A Public Prosecutor is not expected to show a thirst to reach the case in the conviction of the accused somehow or the other irrespective of the true facts involved in the case. The expected attitude of the Public Prosecutor while conducting prosecution must be couched in fairness not only to the court and to the investigating agencies but to the accused as well. If an accused is entitled to any legitimate benefit during trial the Public Prosecutor should not scuttle/conceal it. On the contrary, it is the duty of the Public Prosecutor to winch it to the fore and make it available to the accused. Even if the defence counsel overlooked it, Public Prosecutor has the added responsibility to bring it to the notice of the court if it comes to his knowledge. A private counsel, if allowed free hand to conduct prosecution would focus on bringing the case to conviction even if it is not a fit case to be so convicted. That is the reason why Parliament applied a bridle on him and subjected his role strictly to the instructions given by the Public Prosecutor. That, it follows in the above said Judgements that a plain reading of Section 301 of CrPC reveals that oral submissions by the informant counsel before the Court cannot be independent of the prosecutor and prosecution should not mean persecution. That it is for the said intended objective the Courts have taken an unanimously view that there is no provision in Criminal Procedure Code allowing a complainant or third party to oppose the application for grant of bail or anticipatory bail to the accused persons. Hence the private counsel for the informant does not have an independent right of audience. Is there any suapreme court authority which restricts the pleader of private party to oppse the anticipatory bail. Any authority after 2001.